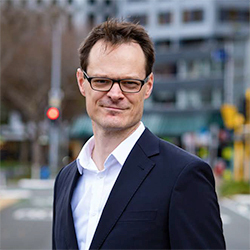 Andrew's current role as Senior Engagement Advisor is an outward-facing role at Victoria University. It involves building relationships with other organisations - government ministries, corporations, community groups and arts organisations - to help with the University's mission to play a more significant role in broader civic and societal affairs. He explains that this means, among other things, "creating opportunities for the University to influence public policy and for researchers to work more closely with industry." It also means finding avenues for students to be more involved in the engagement process. Andrew's role also includes some mainstream communications activities such as media enquiries, preparing media releases and speech writing. Andrew says the skills acquired in his Doctor of Philosophy (Arts) studies are central to his success in engagement. He particularly cites "the capacity for digesting, making sense of and synthesizing complex information to get to the essence of the main issues." This skill is where "the PhD has come to the fore," helping him to communicate well with non-academic audiences today. He also cites the graduate researcher's capacity to build an argument and write clearly and persuasively for effective communication between different audiences. Andrew's engagement role makes use of his deep knowledge of the academic environment and these communication skills "to build a bridge between the academic view of the world and the outside." Andrew's career intention on completing his PhD was to work in academia, which he did for a period. At the same time, he developed an interest in communicating between academia and other audiences and found some opportunities to do this which he greatly enjoyed. The role at Victoria University offered a chance to convert this emergent interest and his PhD experience into a professional career in research engagement and community outreach.